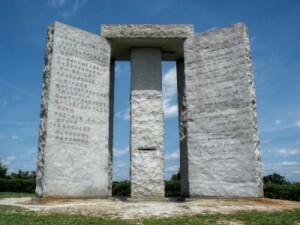 The Georgia Guidestones stand like giant ancient monoliths in Elbert County in Georgia USA; four granite stones that reveal ten written ‘guidelines’ or commandments in eight languages. There are in total five upright stones supporting a giant capstone. Their origin is a mystery, and there is only a record of a certain R.C. Christian who hired Elberton Granite Finishing Company to erect the stones in 1979. The monument was officially unveiled the following year. An inscription on an explanatory tablet set a few feet west of the monument reads ‘let these be guidestones to an Age of Reason’ – obviously referring to Thomas Paine’s work. The tablet also gives facts about the size, weight and astronomical features of the monument, the stones themselves being astronomically aligned, revealing the solstices and equinoxes, with the capstone having an aperture that allows a ray of sunlight through at noon each day indicating the particular day of the year. The stones have of course attracted the attention of conspiracy theorists and were vandalised with graffiti in 2008. Conspiracy theorists have suggested that they are messages from the New World Order or the Rosicricians, or that they may have been designed and erected by followers of the philosophy of Thomas Paine. They may of course be merely a modernist sculpture, but the mystery surrounding the stones certainly adds to their nature.